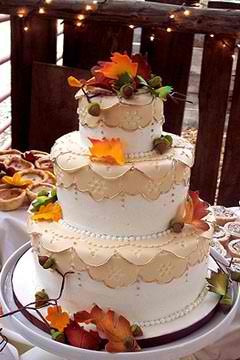 Posted on October 2, 2011 | Comments Off on Autumn Wedding Cakes. Fall weddings are usually known to feature beautiful and rich autumn colors and fruits that come to life in the fall. But like a wedding in any season, you want your decor to emulate the beauty of the season at its best, but how? The most common way to tie all of your wedding details and decor together is the cake. The perfect autumn cakes can certainly wow your guests , here are a few ideas for great designs this season. This large three-tiered autumn wedding cake is sure to add to the classic autumn wedding. It is decorated with white buttercream scroll work, hand crafted orange fondant autumn leaves and fondant fruits and nuts. Oozing with romance, this three-tier dream is more appropriate for a smaller wedding. 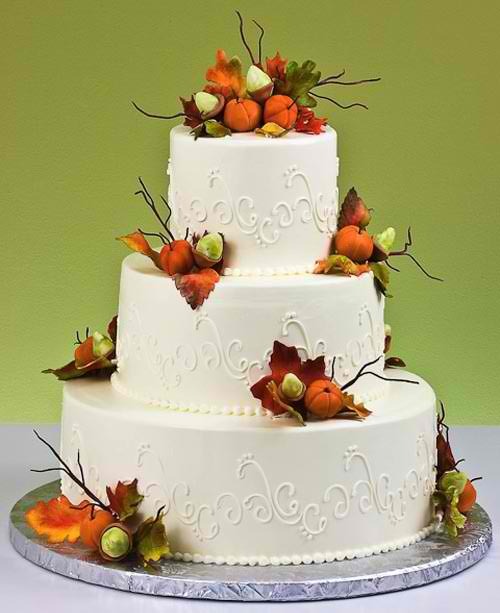 The white and beige, lacy wedding cake is decorated with green, orange and yellow autumn leaves. This huge round four-tier fall themed wedding cake is decorated with edible hand crafted fondant leaves and airbrushed white chocolate fruit. 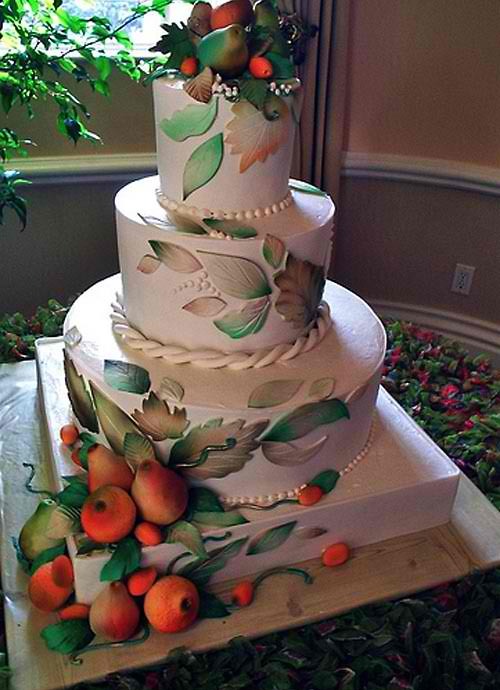 The bottom tier is a square cake with the focus being on the hand crafted fondant fruit and leaves accents. 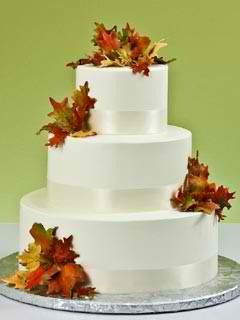 This is a simple white three-tier cake with autumn leaves . The leaves are yellow, orange, brown, tan and green. Decorated with satin white ribbon around each tier. And for those who have a taste for the dramatic, this three-tier wedding cake is for you. It is hand painted and airbrushed in autumn theme earthy colours and decorations and embellished with burnt orange/red fresh roses. Though the ideas and designs are vast, there is a design for everyone’s taste. 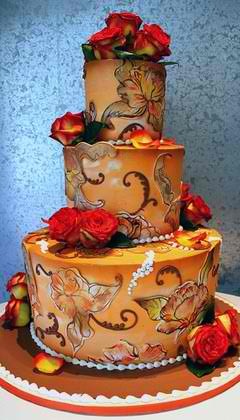 Your baker can even take pieces of many designs and incorporate them into one breath-taking cake. The most popular cake flavor for the fall is carrot cake because of the way it speaks to the autumn feel and colors. This entry was posted in Wedding Cakes, Wedding Decor, Wedding Details, Wedding Planning, Wedding Style and tagged bridal, Green Weddings, Layne Corban, Wedding Cakes, Wedding Day, Wedding Planning. Bookmark the permalink.